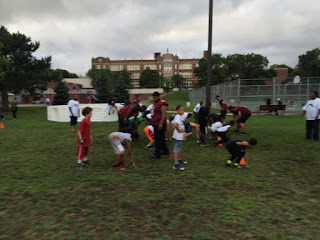 Pioneers had a ball working with North Area Titans and a former Minnesota Viking! The St. Paul Pioneers take great pleasure in working with young people -- on football at camps, and just having fun. This week, several Pioneers volunteered to work with young players in the North End of St. Paul. 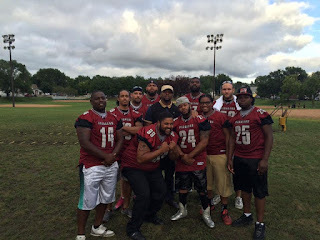 Team president and special teams coordinator Pete Globa and several players had a ball. Here is Pete's post and some photos -- including former Minnesota Viking E.J. Henderson. 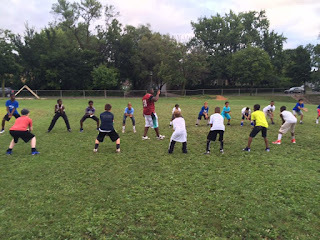 THANK YOU PIONEERS Tyrese Brent Jay BeastMode Pearson Demetric Middleton Jacob Husnik Branden Weigman Jeff McGaster Leandro Limitless Dower Jamal McNutt Moses Louis Hubert Ernest Tucker You all did a great job demonstrating & teaching QB, O-line, RB and WR drills to the North Area Titans. 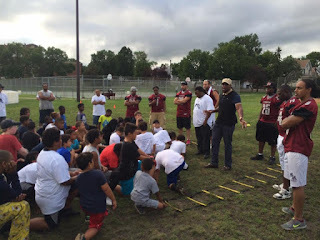 There were over 60 kids in attendance at their Youth Football camp yesterday (Wed July 27 at Rice Rec Center in St Paul) Besides the drills, the campers heard some inspirational & motivational talks from Leandro and Earnest. 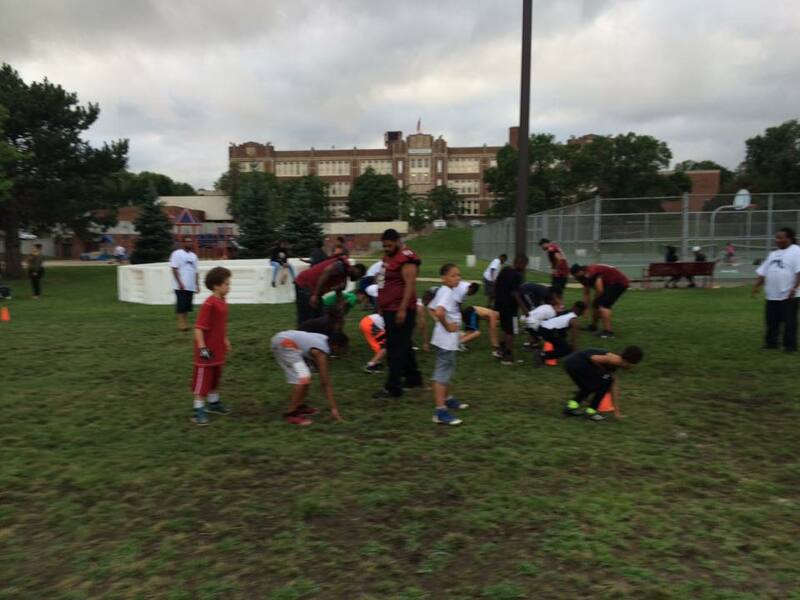 EJ Henderson, former MN Viking, was also in attendance and helped out with Life Skills' lessons and a few drills. Thanks again guys!! 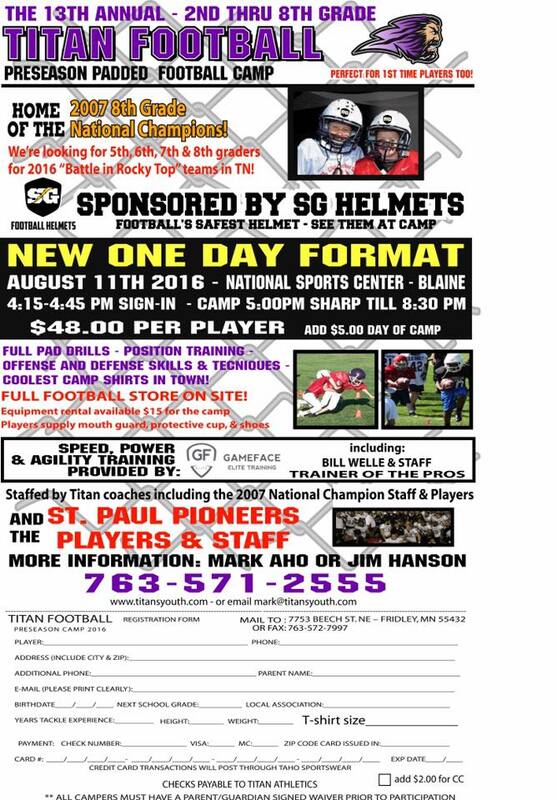 The St. Paul Pioneers are once again honored to participate in one of the best youth football camps out there. 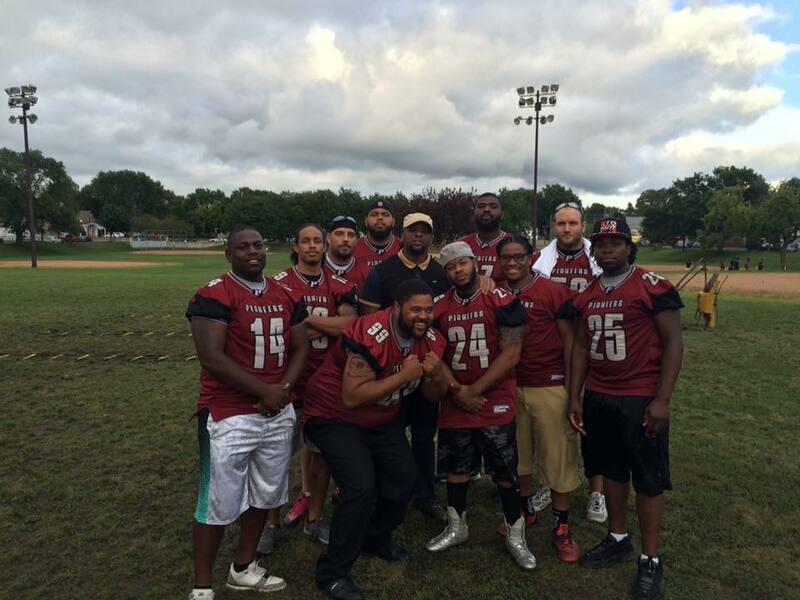 The Pioneers avenged their only loss in NEFL play, beating the North Bank Bulls 38-6. St. Paul turned a 3-0 halftime lead into a rout with a dominating defense and an efficient offense that came alive once torrential rains subsided. Joseph Mapson caught two Cleve McCoy touchdown passes. Brock Keaton ran in a blocked field goal for a touchdown. And Donte Pettis returned an interception for a TD. Defensive end Rob Wills had several quarterback sacks, hits and hurries and intercepted a screen pass. 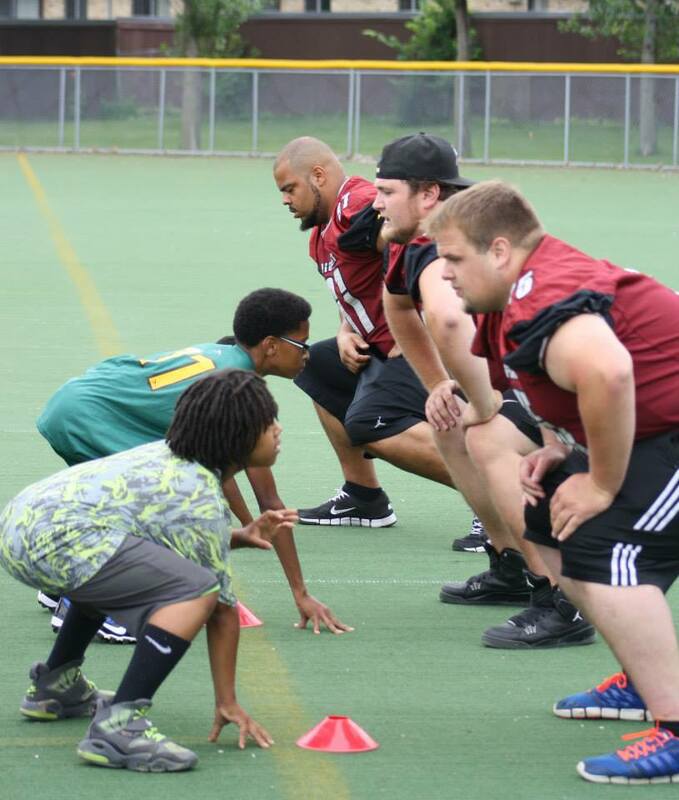 Offense- Joseph Mapson and Cleve McCoy, with a huge assist from the offensive line. Special Teams - Riza Mahmoud. St. Paul wins the top seed in the Minnesota Division and will have a bye next week and play the winner of the Bulls-Brawlers game in two weeks. The game will be at Sea Foam Stadium. It was starting to look like one of those games where the defense and the offense were competing to see who could score the most points. After a first quarter that saw Pioneers running back Ronald Zollicoffer score three touchdowns -- two by rushing and one by punt return -- and Pioneers receiver Joseph Mapson snare a touchdown catch of his own, the Pioneers defense got into the act. In a big way. On the last play of the first half and with the Minnesota Valley Warriors threatening to score, defensive back Lionel Lamarre snared a Warriors pass in the Pioneers end zone. His bobbing and weaving run, helped by a crushing block from defensive back Desmond Stevenson, resulted in a 106-yard interception return for a score. After Mapson's second touchdown catch from quarterback Cleve McCoy, Lamarre would do it again ... although after a much shorter run. Lamarre stepped in front of a Warriors receiver and nearly walked into the end zone from about 25 yards out. The Pioneers defense scored its third touchdown of the game when linebacker Corey Brenner grabbed his second interception of the day and, like Lamarre before him, weaved into the end zone from about 30 yards out. Rob Wills with a sack. St. Paul closed out the scoring with a two-point conversion by Mapson and a 15-yard touchdown run by running back Ernest Tucker. The game was not only a chance for the Pioneers defense to get offensive, but it proved it could be pretty stingy as well., The Pioneers intercepted six Warriors passes on the day on their way to St. Paul's fifth shutout of the season -- 62-0. St. Paul closes out its regular season this coming Saturday at Park of Cottage Grove High School, as the Pioneers face the North Bank Bulls in a rematch of an earlier loss. 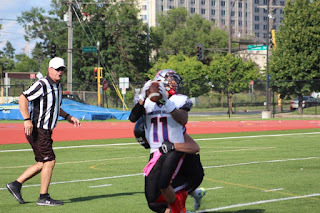 St. Paul lost to the Bulls 16-7 in a defensive game. If the Pioneers hope to win the division and earn a first round playoff bye, their defense needs to play even better. 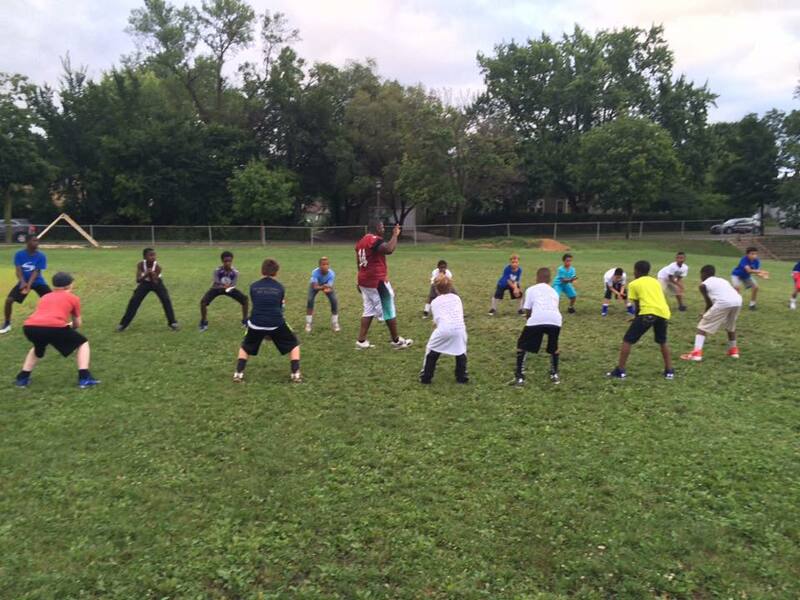 The St Paul Pioneers held its eighth annual Capital City Youth Football Camp on Saturday, July 16, at St. Paul’s Rice/Arlington turf field. To start off the camp, all eight Pioneers players taught 31 (our biggest turnout) future tackle football players, ages 8-14, proper technique for offensive positions such as quarterback, running back, wide receiver and offensive line. The camp concluded with a touch football game, which was enjoyed by all who participated. 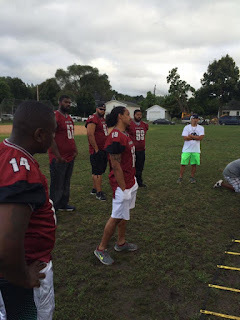 The Pioneers players were coaches and could be heard cheering their respective teams from the sidelines. The kids were revved up too, cheering before each play. Each camper received two free tickets to that afternoon’s game versusthe MN Valley Warriors and could see how their favorite Pioneer played. The St Paul Pioneers are proud to be involved with and promote Alzheimer's Association RivALZ, which is a volunteer-driven event that engages young professionals in friendly but fierce flag football games around the country. 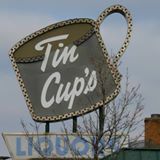 The event raises funds to benefit the care, support and research efforts of the Alzheimer’s Association. Additionally, you are invited to join Blondes vs. Brunettes Twin Cities as they tackle Alzheimer's disease on Saturday September 10 at Concordia's Seafoam Stadium! Divided on the field, yet united in the cause, two teams compete in a single flag football game to inspire fundraising, awareness, and action in the fight against Alzheimer's. Blondes vs. Brunettes, Twin Cities supports our local Chapter of the Alzheimer's Association. Learn more and donate at alz.org/bvb. See you Saturday September 10 at Seafoam Stadium! Final from Sea Foam: Pioneers 62 Warriors 0. Offense - Ronald Zollicoffer with four TDs. 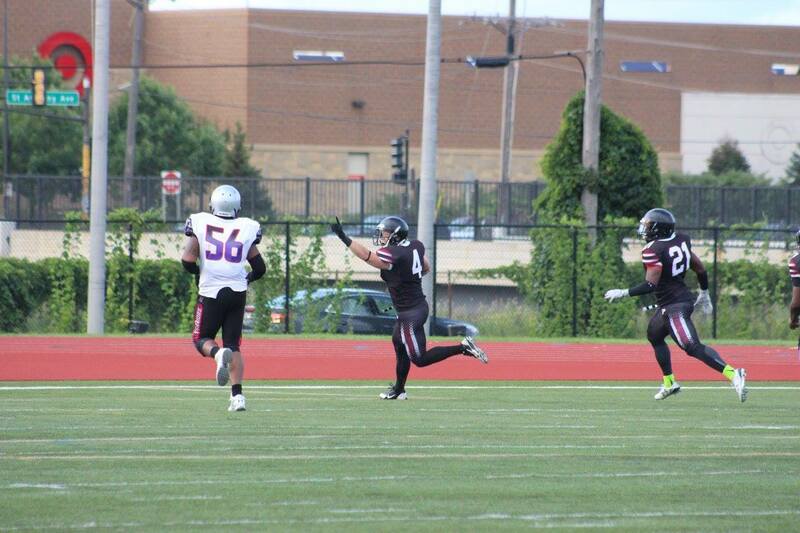 Defense - Lionel Lamarre, with two interception returns for touchdowns, including one for 106 yards. Special Teams - John Ostertag. With the win, the Pioneers improve to 7-3 overall and 6-1 in the NEFL. St. Paul travels to Cottage Grove next Saturday to face the North Bank Bulls, who beat the Pioneers earlier this season 16-7. 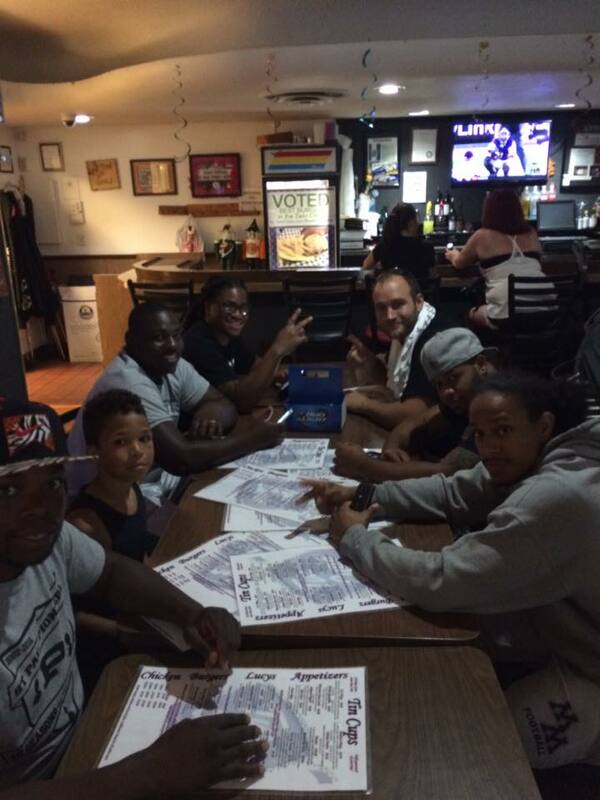 The teams will play their final regular season game, with first place in the NEFL West at stake. 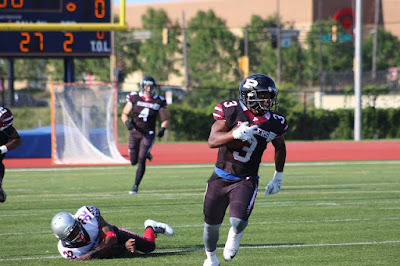 The St. Paul Pioneers defeated the Minnesota Sting 48-0 at Sea Foam Stadium, as quarterback Cleve McCoy threw three touchdown passes and ran for a score and the Pioneers defense held the Sting offense to less than 20 yards on the day. 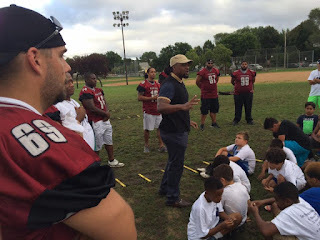 Running back Ronald Zollicoffer had two touchdown runs, receiver Justin Miles had two touchdown catches and receiver Joseph Mapson caught a touchdown pass. Pioneers kickers Jay Harding and Eric Ellestad each hit a field goal. 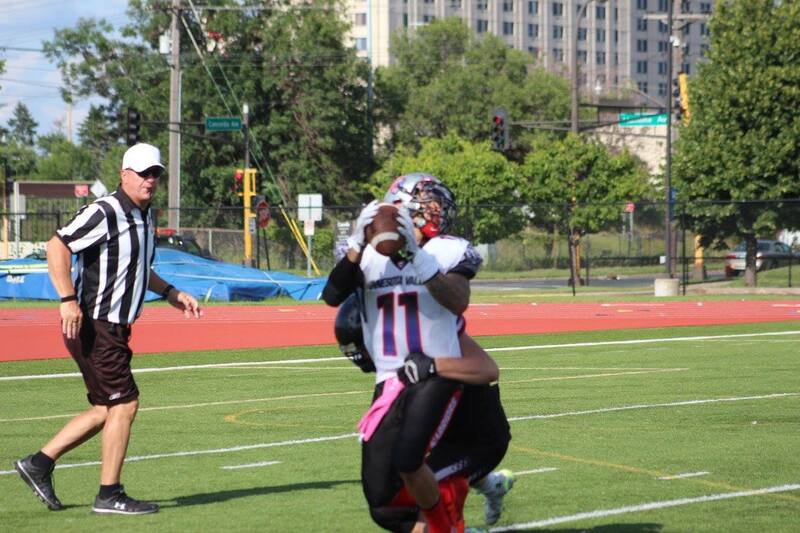 Defensive back Shaquille Theus and linebacker Demetric Middleton had interceptions for St. Paul. With the win, the Pioneers improve to 5-1 in the NEFL, 6-3 overall. Offense - Cleve McCoy and Justin Miles.